New European streaming music service Spotify, which TechCrunch UK has been tracking since October, is getting increasingly good reviews. 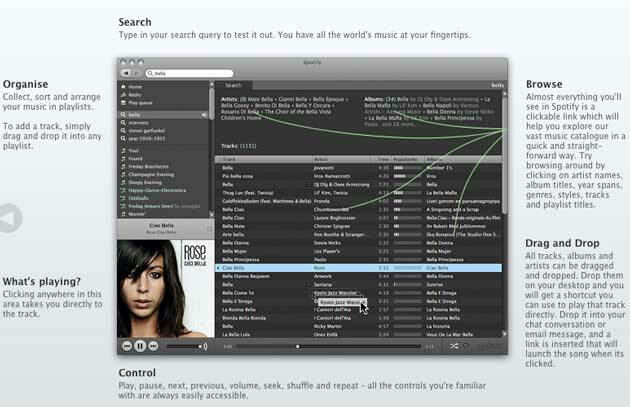 Spotify is a downloadable client for Windows and Mac users that lets you search, browse and stream a deep collection of music. Sadly, it is only available in the UK, Sweden, Finland, Norway, Spain and France and you need an invitation to join (InviteShare is actively trading them). I have no invitation and I live in the U.S., but I’ve been using Spotify all afternoon. There have previously been posts on getting into the service from a banned location once you have an invitation using a proxy server. Today on Digg, though, a commenter left instructions on how to use Spotify without an invitation. I tried it, and it works (for now). It’s likely that the proxy server will be banned shortly, but there are countless others in the non-banned countries. The important thing is to visit this URL from that proxy server. And I recommend you do it now, before the hole is plugged.